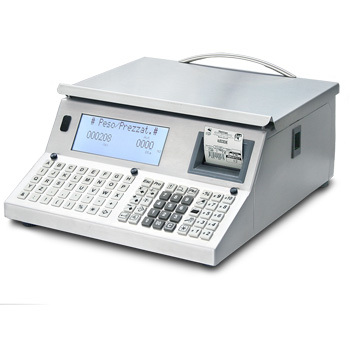 Accurate, reliable, price computing scales with high performance. Suitable for labelling of prepackaged goods. Dual alphanumeric backlit white LCD display, both on operator side and client side. Fast, accurate, mechanical, and waterproof keyboard, with 80 keys of which 40 PLU's with direct access (80 with dual access) and 40 functional keys. 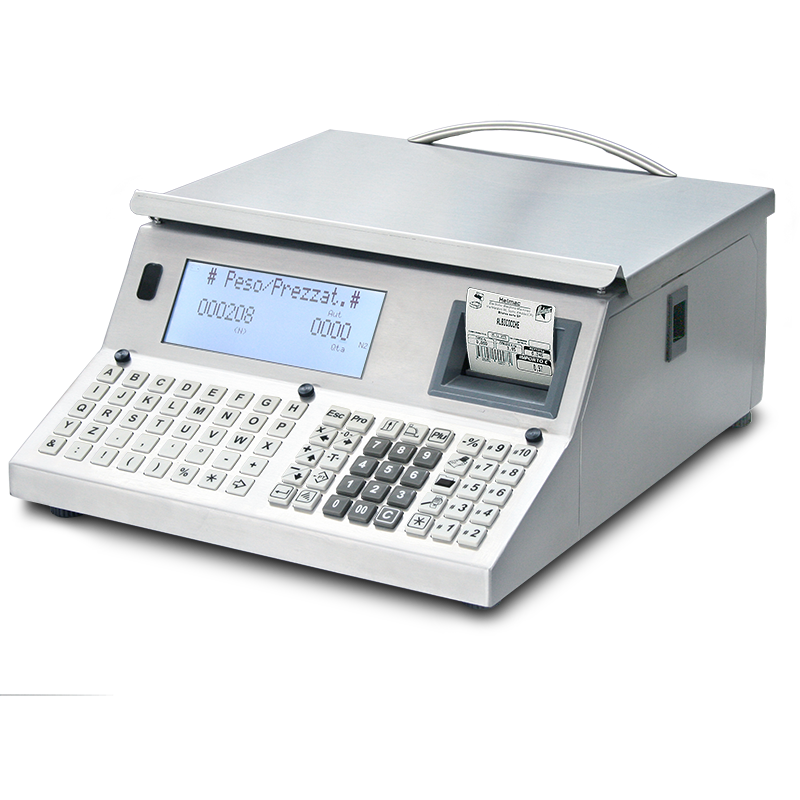 Thermal printer/labeller (usable with thermal paper). 8 dots/mm resolution. Print width up to 55 mm. Paper roll width of up to 63 mm, external diameter of 110 mm. Stainless steel plate, 368x250mm (LxW) size. 230Vac power supply, complete with built-in rechargeable 24Vdc buffer batteries. Selectable operating modes: ticket, pricing-labelling, single article or self-service. Database of 3000 PLU’s, 80 with direct access. 8 preset tares and memory for 20 active tares selectable by the operators. 4 VAT rates with a strips function. Storage and reopening of daily tickets. Cancellations, discounts, special offers, hourly sales reports, customer management. Totals for operators, PLUs, article groups, VAT rates, and short and long term payment types. Prints logos, EAN13 and EAN8 bar codes, price tags with the total, lot, ice. Management of logos and firmware with the HLL (Helmac Label Loader) software downloadable from the web site. 2 RS232 interfaces for connection to: PC, modem, scanner, cash register. 1 RS485 interface for connection with up to 16 GP series’ scales in a network. 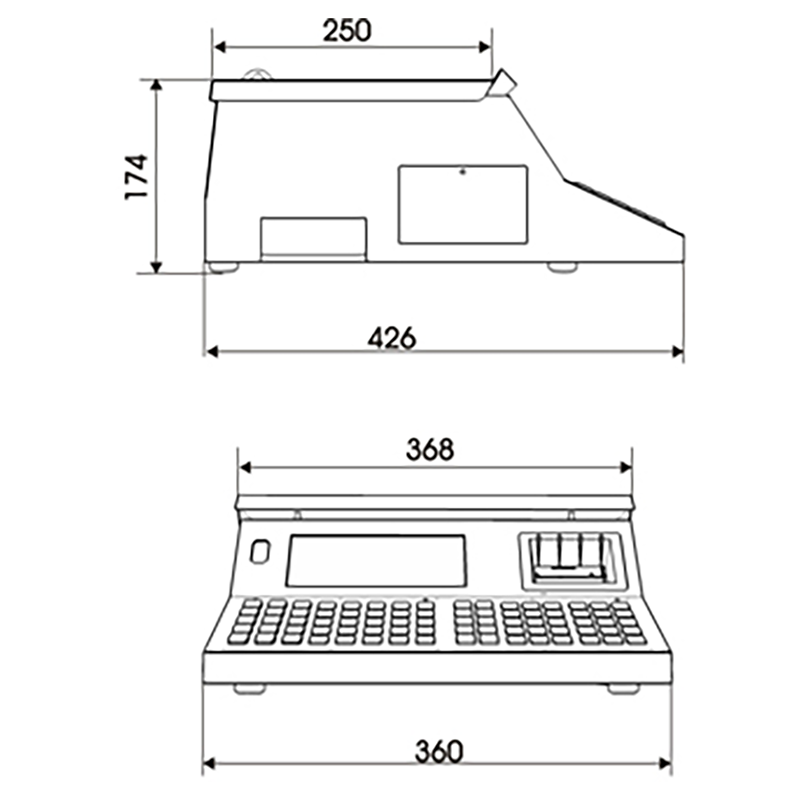 768110 GP4LP scale, 12/30 kg capacity, 2/5 g division, with stainless steel structure and 375x315 mm plate, dual backlit LCD display on column, 80-key mechanical keyboard, thermal printer/labeller with paper cutter, and cash register drawer opening. 810050 Ethernet interface kit for connecting the scales to the PC. 810057 Ethernet-USB interface kit for connecting the scales to the PC and in a network. 810180 Ethernet WIFI module to create a scale network and connect to PC. 810174 Ethernet WIFI module fitted with USB port, to create a scale network and connect to PC (max.4 scales without access point, up to 8 scales with access point). 810061 WiFi antenna, 20cm long, to increase the strength of the communication signal between the scales. 810010 Stainless steel bowl-shaped plate ("svizzera" type), dimensions 310 x 410 mm, height 50 mm. 700500 Painted metal cash drawer for coins and bills, size: 405x355x90mm, fitted with 4 compartments for bills and 8 compartments for coins; electronically managed through the keyboard. 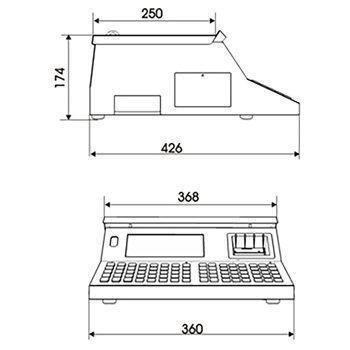 700506 Stainless steel cash drawer for coins and bills, size: 425x410x110mm, fitted with 6 compartments for bills and 8 compartments for coins; electronically managed through the keyboard. 810231 Custom-made labels (logo insertion, setting of label, header, closing messages, etc). Note: the customisation is possible after an analysis of the Helmac technical staff. 806002 Ethernet shielded cable 3 m long for connection between scales. 806005 Ethernet shielded cable 5 m long for connection between scales. 821235 Cable 2,5m long for connecting the scale to the PC. 841239 USB-RS232 cable 1,8 m long for the connection between the scale and the PC, fitted with USB connector on PC side and RJ connector on scale side. 880049 20 rolls of thermal paper, 60mm x 130m size, 109mm outer diameter, 40mm diameter of central hole. 880050 20 rolls of adhesive thermal paper, 59mm x 57m size, 109mm outer diameter, 40mm diameter of central hole. 880034 24 rolls of 1000 white labels, 58x53mm size, 40mm diameter of central hole. 880035 32 rolls of 1000 white labels, 58x43mm size, 40mm diameter of central hole. 880036 24 rolls of 900 white labels, 58x60mm size, 40mm diameter of central hole. 880037 24 rolls of 750 white labels, 58x74mm size, 40mm diameter of central hole.